It wasn't always this way. I used to go to indoor cycling class religiously, every week at the local White Plains, NY YMCA. I got into indoor cycling years ago while I was unemployed and living with my parents. I had messed up my knees running, and a physical therapist friend of mine suggested indoor cycling as a low-impact alternative. 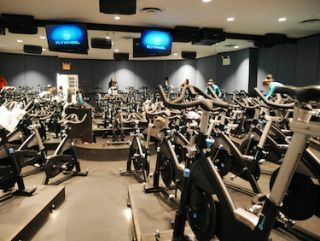 The new Flywheel indoor cycling studio in New York City boasts a Bose Pro sound system to help motivate class members as they exercise. "Why not just ride a bike?" I asked. "Do you own a bike?" she replied. Point taken. A few weeks later I was in my first spinning class. The White Plains YMCA is not a high-tech facility. Indoor cycling class took place in the same gymnasium as yoga class, zumba class, step aerobics class... all the classes. Our instructor was a ridiculously friendly, encouraging, mellow guy with a mustache named Mike. He would plug his iPod into his single-speaker iPod dock, turn on some early '90s club music, and off we'd go. He always had a big smile on his face as he encouraged us up our imaginary hills. This was my history with indoor cycling when I walked into the Lincoln Square Flywheel in New York City on a bone chilling winter's eve. Flywheel is part of a chain of a new school of indoor cycling studios, and within seconds it became apparent that between the time I had stopped going to the YMCA and walked into that Flywheel, indoor cycling had gone through a radical transformation. I had read about this transformation a bit--how indoor cycling had achieved cult-like status among a core constituency of people who, unlike me, exercise, and how some of these people were even waiting in line to be in the front row at these classes while wearing shirts that said "Front Row" on them, which really does sound horrible, I know. I also knew that it had gotten really expensive to really love indoor cycling. Flywheel, for example, charges $34 for a one-hour class. That's like half a cell phone bill! And, in many "Judgement Free" zones, maybe even the cost of a full gym membership. How, I wondered, could they get away with charging so much for something as basic as riding a stationary bike in a room full of people? Walking into Flywheel, you’re greeted by a sign bearing the company’s motto: Never Coast. This is ostensibly in reference to what one should never do on one of their bikes (because when you are coasting you aren’t pedaling and when you aren’t pedaling you aren’t burning calories) but can easily be extrapolated to a grander outlook on life. Flywheel, after all, isn’t just about exercise. It is a way of life. At a computer kiosk I signed up for my class, chose my seat, and told one of the hosts my shoe size. I would need special indoor cycling shoes to ride this ride. All of Flywheel’s studios are stadium-style riding environments, like the way the nice new movie theaters are, but with bikes instead of seats. I chose seat 15, a central seat in the second row. I wanted the full experience without all the pressure of being directly in the instructor’s field of vision. And besides, I wasn't about to fight for front row status. She said that it was her favorite sound system at all of Flywheel's locations, then went on to double check that I had been to a indoor cycling class before, and hopefully wouldn’t pass out from exhaustion in the middle of our ride. The room filled up pretty quickly, and before I had the chance to size up my sold-out class of fellow indoor cyclers, the lights went very dim, Bree’s wireless headset went live, and the music started pumping. And this is when it truly became apparent that I wasn’t in Mike’s indoor cycling class anymore. For the Lincoln Square installation, a wide range of Bose Professional products were chosen, including: Bose RoomMatch Utility RMU-208 loud speakers, Bose ControlSpace CC-64 Control Centers, Bose MB4 Modular Bass loud speakers, Bose DS-40SE loud speakers, Bose ESP-00 Series II Engineered Sound Processor, Bose PM-8500N PowerMatch Configurable power amplifiers, and Bose CC-4 Control Centers. Shure SLX Wireless Microphones, Tascam CD200iLs, and Middle Atlantic rack equipment complement and round out the installations for a complete state-of-the-art audio solution. "We always try to use the best quality equipment we can get," explained Gene Esposito, vice president of DFX, the integrator for the project. "The Bose Pro Series is state of the art and fits perfectly into [an indoor cycling] studio environment. Bose has good clarity and sound pressure level. We can make it the volume that's allotted for the space, not blow peoples ears up, but make sure the audio is loud and clear." Bree and her enthusiasm played a huge part in motivating the room. She worked overtime to pump us up, running around the room, yelling things like "2015!" and functioning not only as an exercise coach, but also a hype man, DJ, and motivational speaker. But ultimately, it was the sound system that really pushed the participants: the system was so incredible that it was easy to forget that you were even exercising. "Funny, I feel the same way!" Bree told me after class. "I let the music dictate my delivery; I do not go against the tone of the tune. Naturally responding to music will lead to a more authentic workout. Don't fight what's happening musically; use it as one of the many resources in class to work harder." And work harder I did. In the email I received after class recapping my ride, Flywheel told me that I had biked an astounding 19.8 miles during class, and had burned between 657-732 calories. I couldn't believe it. Again, Bree praised the music and the system. “The sound quality can make or break a class,” she said. “There’s something primal that occurs physically when you are working out to a motivating song: you literally work harder. The volume level can directly correlate with how hard you push yourself, when used effectively." One time at my old YMCA, Mike was absent, and a substitute instructor graced us with her presence. She barked orders at us and had way too much energy. It was weird. If she had been my indoor cycling instructor the very first time I ever went indoor cycling, I wouldn't have returned. But after taking a class at Flywheel it struck me that she wasn't necessarily a bad indoor cycling instructor, she just wasn't in the right technological environment. Had she been backed up by a light show and some bass-heavy dubstep, her level of enthusiasm would have probably felt right at home, and I would have probably cycled way more vigorously than I did. At $34 a class, this new breed of indoor cycling is a big business, and it's growing fast. But without the AV, there is no new breed of indoor cycling. There is no cult-like following. Gym owners and gym goers alike are focused on one thing: the experience. But without high quality AV there is no experience. There's just a room with a bunch of people sitting on a bikes, getting yelled at, and going nowhere.